Agricultural Microbiology Objective Questions and Answers MCQs PDF. HomeAgricultureAgricultural Microbiology Objective Questions and Answers MCQs PDF. 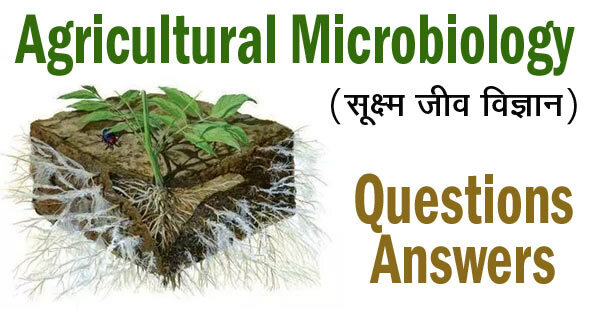 Agricultural Microbiology Questions : Dear Aspirants, Most important Agricultural Microbiology Objective Multiple Choice Questions and Answers useful for General Agriculture for ICAR and other JRF, SRF, ARS, Ph.D., M.Sc. IBPS, AFO, AO, IFS, NABARD Agri Competitive exams and Tests. 3. Pseudomorein is an organism? 10. Which of the following insecticides ? 12. Factor which does not affect legume root nodulation ? (C) Combined N 2 (D) H + ion cone. 28. In autoclave which form of heat is used ? 34. Which of the following does not produce any enzyme? 35. In Archaebacteria which one is present in the cell wall ? 50. Which of the following genera is most likely to contain organisms capable of surviving high temperature?